I think it's a sign. I was out for a walk and saw a beautiful globe artichoke plant growing in my neighbor's garden. That night, a friend of mine was gifted an artichoke plant and she asked me how to care for it. The next day, my Grandma sent me an email about how she LOVES growing artichokes. The Blog Gods are speaking to me, "Do a post on globe artichokes!" Perennial (come back year after year). They can survive up to 6 years! They will grow to be 3-4 feet tall. The part that we eat is actually a flower bud. California produces nearly 100% of the commercially produced artichokes in the US. Artichokes are said to be an aphrodisiac. 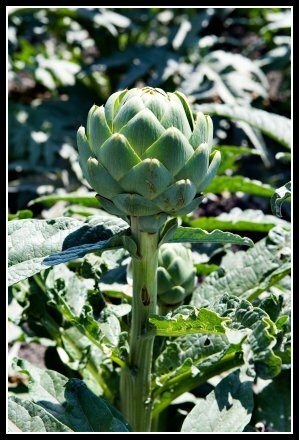 In the growing season (summer), artichokes do best with temperatures between 50-75 degrees. 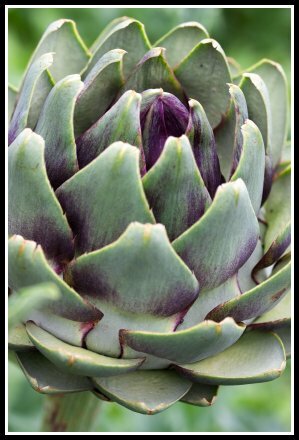 Artichokes prefer areas with mild winters (not below 20 F) and cooler summers (not above 75 F). Artichokes need to be exposed to less than 50 degree temperatures to initate the flower stock in the spring. This is called vernalization. It's very important to maintain even soil moisture (adequate drainage). Once winter approaches it's a good idea to winterize your plants. Cut the foliage down to about a foot above the ground and cover with mulch (a lot of it). If temperatures are going to dip below 20 F, you may want to dig up the plant and store it in a bucket inside. 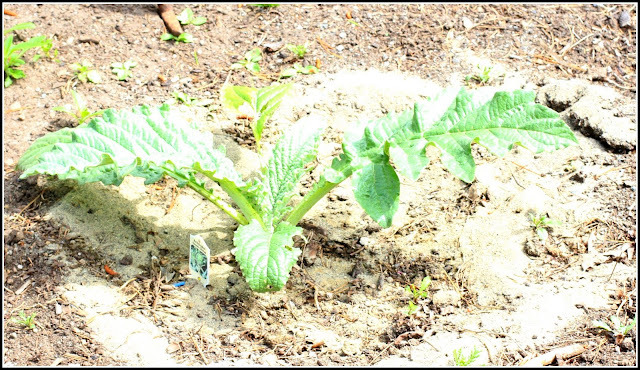 Artichokes are heavy feeders and may require a nitrogen-based fertilizer every 4 weeks in the growing season. 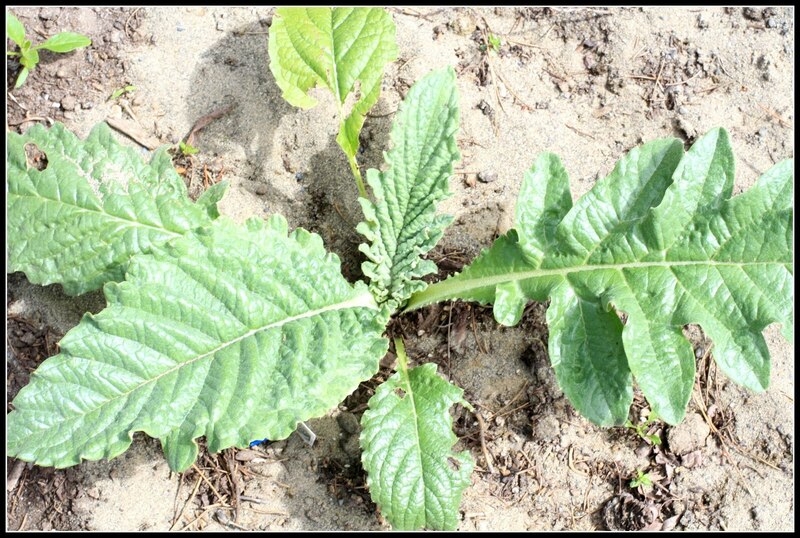 Slugs love artichoke leaves. My Grandma tried the sand method around the base, and has not seen a slug since! Aphids, blast them off with a hose, and try an insecticidal soap. You will be able to harvest in late July or early August, and it will continue until the first frost. Each stock will produce 3-5 buds. Harvest when the artichoke is still closed and about 3 inches across. Cut off the bud including 2-3 inches of the stem. Wish I had room to grow artichokes! I'm all 'choked up!